In the summer months leading up to their August graduation, forty students in YouthBuild’s Class of 2012 enrolled in postsecondary classes at Community College of Philadelphia (CCP) and Thaddeus Stevens College of Technology in Lancaster, PA. This “summer bridge” option is offered to students who have completed their academic graduation requirements ahead of schedule, and allows them to experience college-level instruction and standards while still connected to YouthBuild staff and supports. 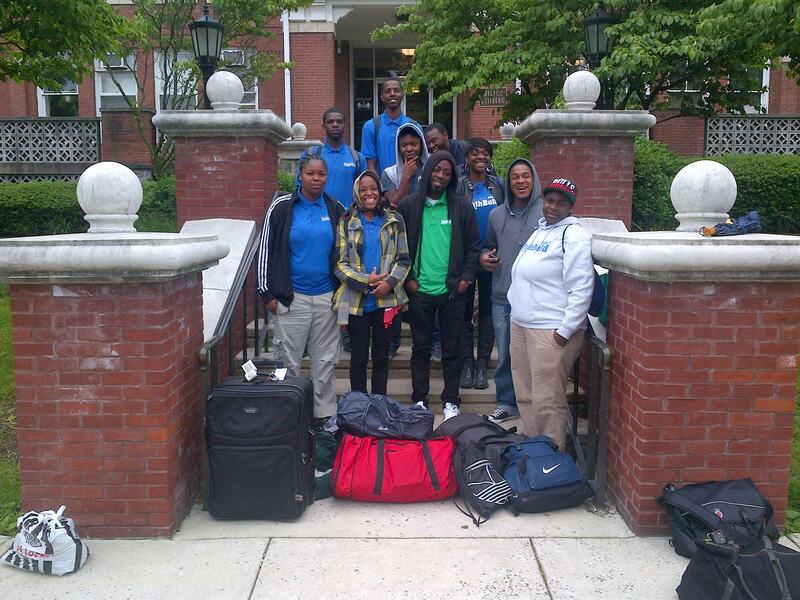 YouthBuild students traveled to Lancaster, PA to live in dorms and take classes at Thaddeus Stevens College of Technology this summer. Students in the college bridge programs worked hard all year to meet YouthBuild’s rigorous academic standards – which are designed to equip students with the academic and personal skills necessary for success in college as well as careers – and thrived in the new educational settings. Thirteen men and women spent the summer at Thaddeus Stevens, living in dorms and taking classes. Upon completion of the 10 week program, eleven applied and were accepted to enroll as full-time students in the fall to study plumbing, architecture, and other trades. Meanwhile, students at CCP passed into higher-level courses for the fall, and the students who had taken Education courses earned 3 college credits. A total of 20 YouthBuild students from the summer bridge program (in addition to an estimated 5 more, who spent the summer at internships) will enroll at CCP in the fall. While students rose to the challenges presented by a new learning environment and new academic expectations, YouthBuild staff and partners also went above and beyond to ensure the success of the program. Some staff took turns living in a dorm at Thaddeus Stevens with the summer bridge students. Meanwhile, in Philadelphia, several teachers and YouthBuild Transitions Department staff moved their base of operations from YouthBuild to CCP for the summer. Staff continued to work with students who enrolled at Community College of Philadelphia, emphasizing advanced study skills and facilitating their transition into a new academic setting. The goal of the summer bridge programs is to ensure not only that YouthBuild students go on to enroll in postsecondary institutions, but also that they thrive in those settings through the completion of a degree. A successful summer bridge requires a postsecondary partner – like CCP or Thaddeus – that is truly invested in supporting and creating opportunities for YouthBuild students. In recognition of their dedication to YouthBuild students and their efforts in support of the bridge programs, YouthBuild gave awards to Chris Metzler (Thaddeus Stevens) and Abbey Wexler (CCP) at the Class of 2012 August 31st graduation. Thanks to hard work by our staff and and a network of exceptional partners, the bridge programs stand out among the life-changing opportunities offered to students at YouthBuild Philadelphia Charter School, and will continue to improve and grow in the years to come. Previous Post Congratulations Class of 2012!